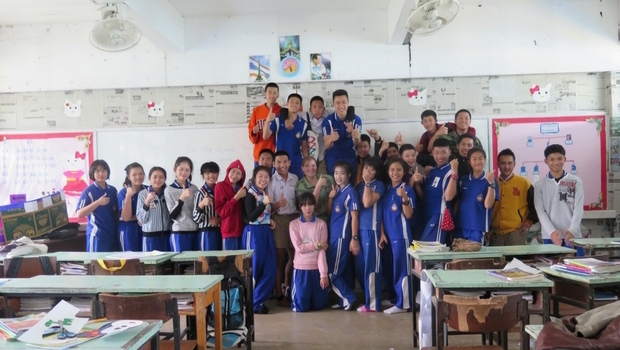 Kristen with her students in Phayao Province, Thailand. Photo courtesy of Kristen P.
If you’re thinking about teaching English in Thailand, you probably have a ton of questions: Where will I teach? What’s it like to work at a Thai school? Is the salary enough to live on? Look no further than our experience alums for answers! We sat down with former participant Kristen Palmer to get the lowdown on what it's actually like to teach abroad in Thailand. 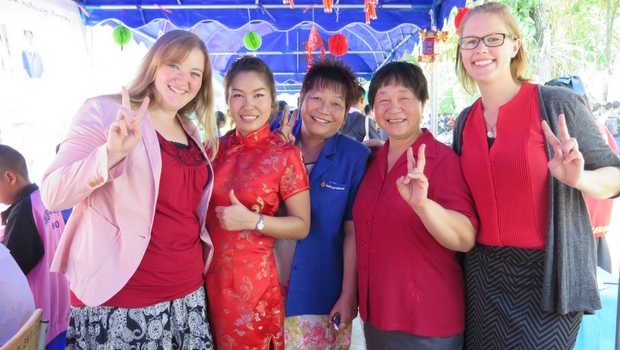 Kristen taught English in Phayao Province for two years before joining Overseas Education Group (OEG), InterExchange's partner in Thailand, as an International Advisor. This is the first part of our conversation. Why did you decide to move to Thailand to teach? After graduating from college, I worked several part-time jobs for a year but couldn’t find any opportunities for a career that I was interested in. I knew friends who had taught English in Vietnam and South Korea, so I thought that teaching English might be a good way for me to get work experience, travel, and prepare myself for graduate school when I came back to the U.S.
Did you have teaching experience prior to the program? I had no prior teaching experience, very little experience working with kids, and I didn’t even really like public speaking. I knew this was going to be an experience that would push me out of my comfort zone. I taught at Phusangwittayakhom, a small public secondary school in Phayao Province (close to the Laos and Burmese borders). 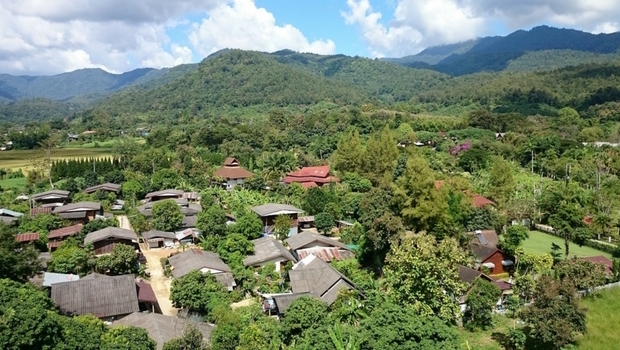 Phusang is a small, somewhat rural village, so most of my students’ families were rice or rubber tree farmers. I taught mattayom 1, 2, and 3 (the American equivalent of seventh, eighth, and ninth grade). My smallest classes had about 25 kids and my largest up to 40. Initially, I was shocked at the low-level of English of some students. In some classes it seemed like they knew practically nothing. However, as our time together went on and we grew more comfortable with each other, I started to learn what they knew already and we worked together more effectively. What was your relationship like with fellow Thai teachers? My English department was very social. At least a couple days per week, all the teachers would make lunch in the office and eat together. Some of the teachers liked to practice their English and ask me lots of questions; however, some were very shy and hesitant to make conversation or even speak to me. Thai people in general are quite reserved, especially in a professional work setting, so it took time for me to build relationships with everyone. Kristen with fellow teachers at a school event. I did not have a co-teacher who always came to my classes with me. I was expected to manage them on my own. However, if I had discipline or behavior issues with some classes or students, I spoke to teachers in my department for advice and help. If I was having real trouble with a class, they would assign someone to come to class with me and help students for a few weeks. Also, the other foreign teachers and I would sometimes go to each other’s classes to help with activities and classroom management. Were you provided a set curriculum and textbook from which you created lesson plans? My first semester I was given a set of outdated textbooks with speaking and listening activities. The listening activities were on cassette tapes; however, the tapes were long gone. Even if they weren’t, who knows where I would have found a working cassette player! At first it was frustrating and difficult to have minimal guidance for lesson planning. Eventually, I learned how to adapt the book to fit with the level of my students, and designed my own listening and speaking activities. The following semester, I was given course outlines and was free to design all my lessons and activities as I wanted. I was also responsible for writing and administering my own midterm and final exams, and deciding how I wanted to evaluate my students. Kristen administers an English test to eighth graders. When I asked teachers in my department what else I should be doing, or how to meet the school’s expectations of me, I was told, “Play games! Speak English! You’re the American teacher. Up to you.” Because my school was in a rural area, they were just happy that the kids were engaging with a native English speaker and having fun using the language. The quality or quantity of what they were learning was secondary. Of course, this isn’t the case for all schools. Private schools in big cities with more resources will have higher expectations from teachers and from students. The standardized tests in Thailand have an English grammar component. This means that Thai students have been studying English vocabulary and grammar for many years with Thai English teachers. So although most students will have a decent vocabulary, they struggle with listening and speaking skills. They need help learning how to take the vocabulary they already know and putting it together to form complete thoughts and sentences. This is where native speakers come in. What differences did you notice between the Thai school system and the U.S. system? One of the biggest differences in the Thai school system is that Thai students cannot “fail” a class. At my school, if a student “failed” my class, I was expected to give them extra work that would bring their grade up to a passing grade. This can be extremely frustrating for Western teachers, who are asked to pass a student who didn’t do any work. However, I tried to keep in mind that even though some students appreciated my class and wanted to learn English, not all students enjoy all subjects and perhaps English just wasn’t their thing. Kristen's Thai students in their classroom. Also, students are arranged by test scores into classes. That means that classes are generally grouped by average academic ability. In a given class you can have kids who are nearly fluent in English learning alongside kids who can barely write their name. I always liked to think that the kids who had poor English skills maybe made up for it in math or science! Check out the second part of our conversation of our conversation with Kristen where she'll talk about salary, traveling around Thailand, and and her lifestyle abroad. InterExchange's Teach English Thailand program is a great way to experience Thai culture while gaining professional teaching experience. No teaching experience or Thai language skills are required—just a bachelor's degree, an open mind and flexibility.